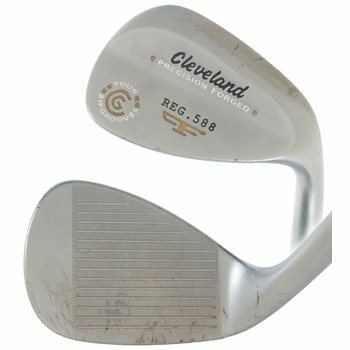 The Cleveland 588 Forged Wedge is made from 1025 carbon steel, the 588® Forged wedge offers golfers an incredibly soft yet solid feel, as well as the highest level of manufacturing consistency for supreme confidence and trust over every shot. The 588® Forged wedge’s Tour Zip Grooves™ and Laser Milled™ technology help to maximize spin in accordance with USGA regulations. Exclusive to the 588® Forged wedge is the Tour Concept Wedge steel shaft, co-developed and engineered by Cleveland® Golf and industry leader True Temper. With a unique stiffness profile that features a less active tip, this shaft promotes a more penetrating ball flight, increased spin and optimal distance control along with superior feel.